(Kym) There are tons of different reason in what moved each person to buy a 3D printer, so I want to share my story, how all of this took life. I was into electronics since a while, and wanted to get a printer as prices were starting to get accessible for small starters, but I knew that a 3D printer doesn’t just print as a desktop inkjet printer. The choice available increased since 2010, now there were a number of models on the Market for personal use 3D printers. But organic models at the time were quite limited online, so it was hard to see a use of it for figurine making and art. 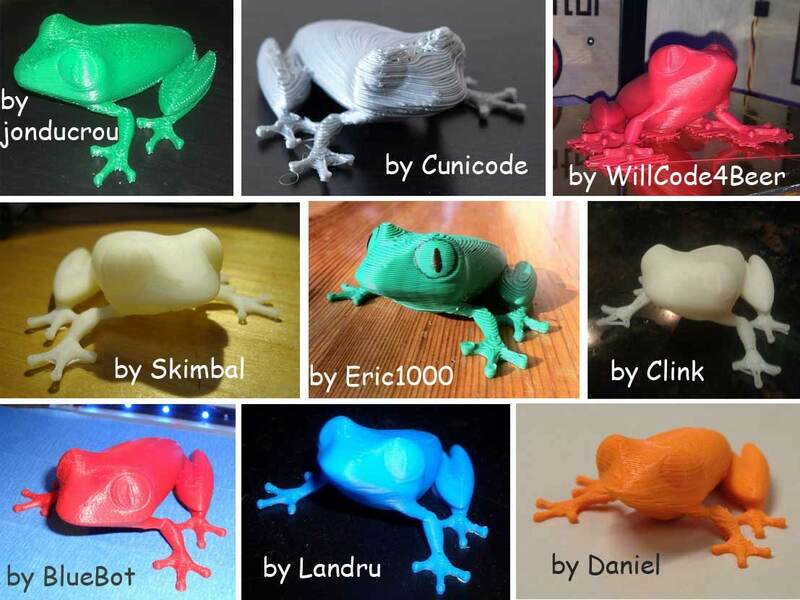 So Morena had an idea: she modeled a cute red eyed tree frog with tiny angled legs, so to test the smoothness, the resolution, and the ability to print on low degrees angles small parts. She asked other users to test it for her and let her know the setting they used. We liked a lot the one printed by Bluebot, who is a users of Ultimaker. I checked all the documentation about this machine, and so this is how I decided this was the printer that I wanted. So I put an order and waited patiently for it to arrive.